It was a while since I posted last time.You probably can relate how busy this time of the year is for all of us. It looks like every year it gets busier and busier. But it is still my favorite time of the year with Holidays in the air, Christmas tree in the living room all decorated and entire family making plans for Christmas and New Year. I did my list of people I would like to send cards this year - and it is quite long (what is amazing!) I am sure you can use more cards as well. I am starting new series " Christmas Cards Quick" - some ideas for you to mass produce. Many of those cards were part of my Happy Hour Class or Christmas Stamp a Stack, so I can insure you cutting and assembling them are fairly easy. 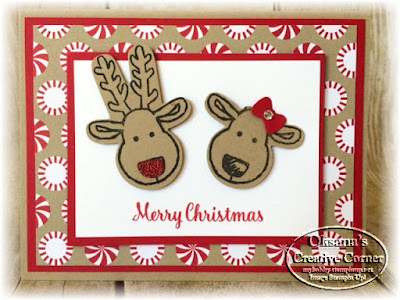 Reindeer image from Cookie Cutter stamp is my absolute favorite! Even so Candy Cane DSP is sold out - you can substitute it with any other one. If you need anything - visit my store. Hostess code is 2MPF9NGM.